Watch their faces light up and their eyes widen when you test out cool chemistry. You will definitely get a positive reaction from the kiddos (pun intended). 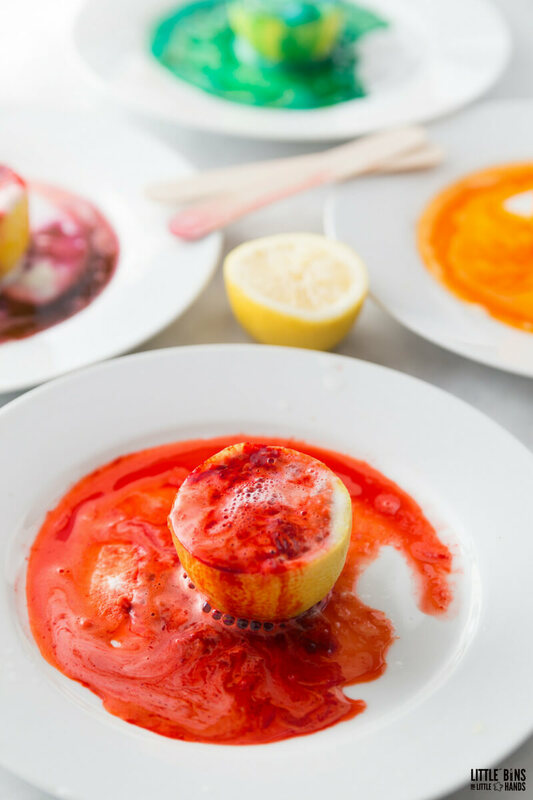 Great science is as simple as walking into the kitchen with this erupting lemon volcano chemistry experiment! We enjoy all kinds of simple science and STEM using common household ingredients including baking soda and vinegar reactions. This fun science activity can even be taken outside for easy clean up. ERUPTING LEMON VOLCANO CHEMISTRY EXPERIMENT! We are pretty familiar with our fruit volcanos around here including apple volcanos, pumpkin volcanos, and watermelon volcanos! It’s definitely a fun twist on the classic volcano that doubles as a seasonal theme science activity or experiment. Plus, we have also experimented with citrus reactions, so an erupting lemon volcano chemistry activity is a natural fit for us! WATCH THE CHEMISTRY IN ACTION! Let’s keep it basic for our younger or junior scientists! Chemistry is all about the way different materials are put together, and how they are made up including atoms and molecules. It’s also how these materials act under different conditions. Chemistry is often a base for physics so you will see overlap! What might you experiment with in chemistry? Classically we think of a mad scientist and lots of bubbling beakers, and yes there are reaction between bases and acids to enjoy! Also, chemistry involves matter, changes, solutions, and the list goes on and on. We will be exploring simple chemistry you can do at home or in the classroom that isn’t too crazy, but is still lots of fun for kids! You can check out some more chemistry activities here. One of the things that we strive to do here is create playful science set ups that are extremely hands-on, maybe a little messy, and whole lot of fun. They may be somewhat open ended, contain an element of play, and definitely a whole lot of repeatability! MAKE AN ERUPTING LEMON VOLCANO! Make sure the following supplies are on your next grocery shopping list and you will be ready for an afternoon of exploration and discovery with your kids. 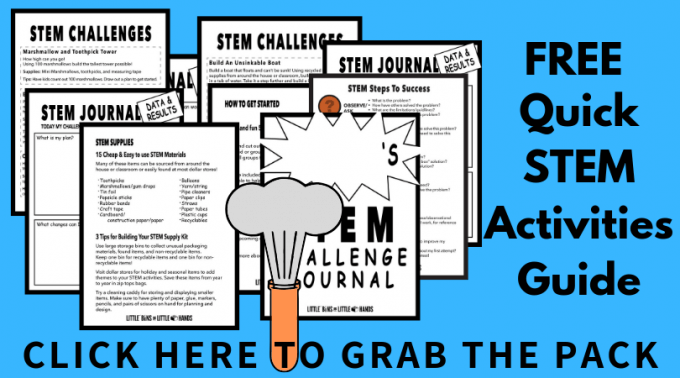 At the bottom of this page grab your FREE simple science experiments printable recipe cheat sheet! Easy and fun kids science experiments to keep on hand for whenever! Also check out: 35+ Classic Science Experiments Kids Have To Try! Lemons (grab a few) and Limes too! First, you need to place half of a lemon onto a bowl or plate that will catch the mess when it erupts. 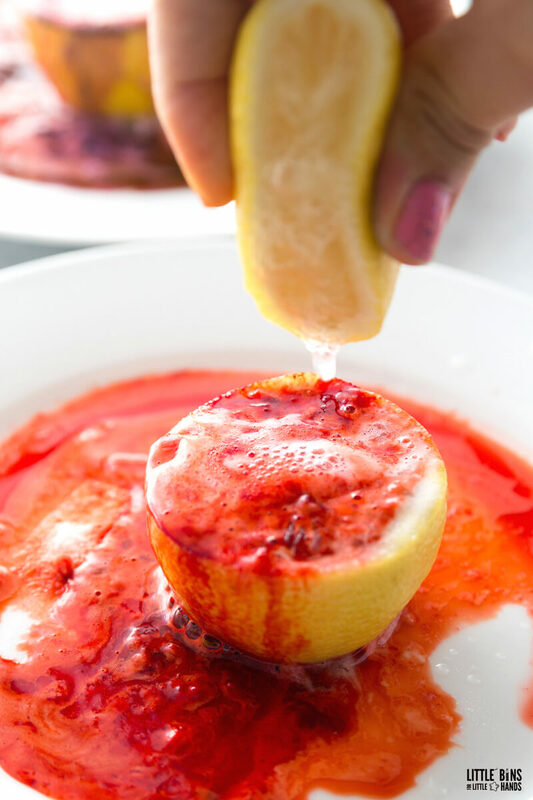 You can juice the other half of the lemon to add to the erupting lemon volcano which you will read about below. Or you can set up two at a time! EXPERIMENT: Try this with a variety of citrus fruits to see which produces the best eruption! What’s your guess? Next, take your craft stick and poke holes in the various sections of the lemon. This will help the reaction along a bit in the beginning. 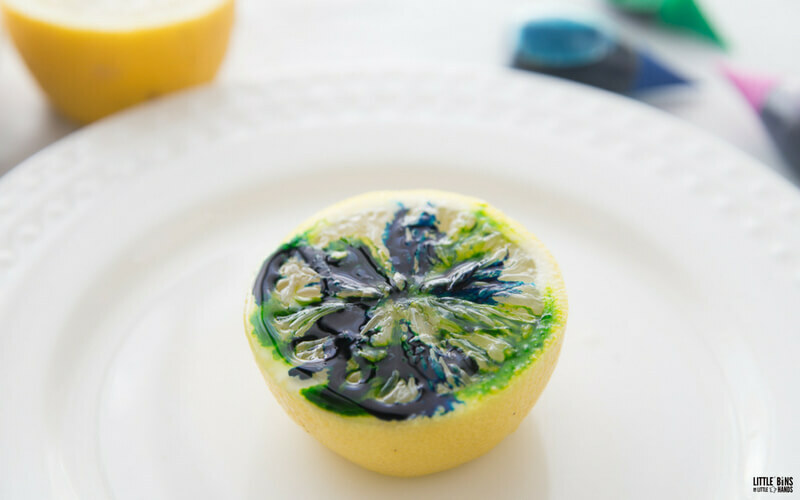 Now you can place drops of food coloring around the different sections on the top of the lemon. 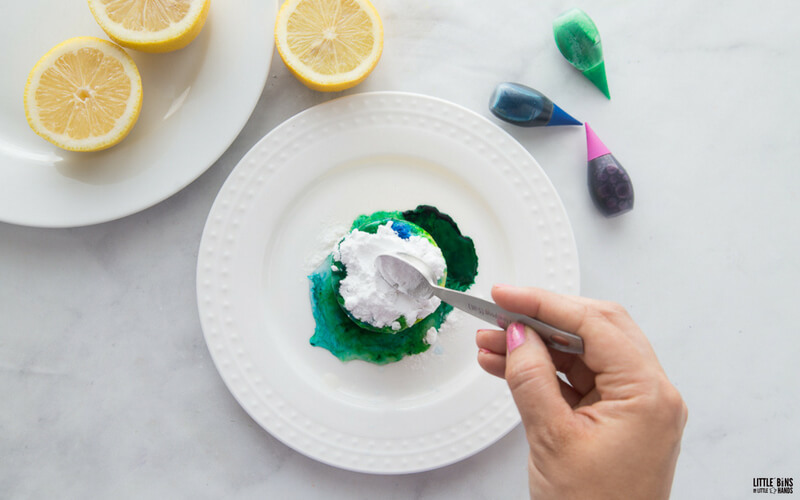 Alternating with different colors of food coloring will give a fun effect. However, you can also stick with just a couple colors or even one color! Next you can pour some Dawn dish soap all over the top of the lemon. What does dish soap do? Adding dish soap to a reaction like this will also produce a bit of foam and bubbles! It’s not necessary but a fun element to add if you can. 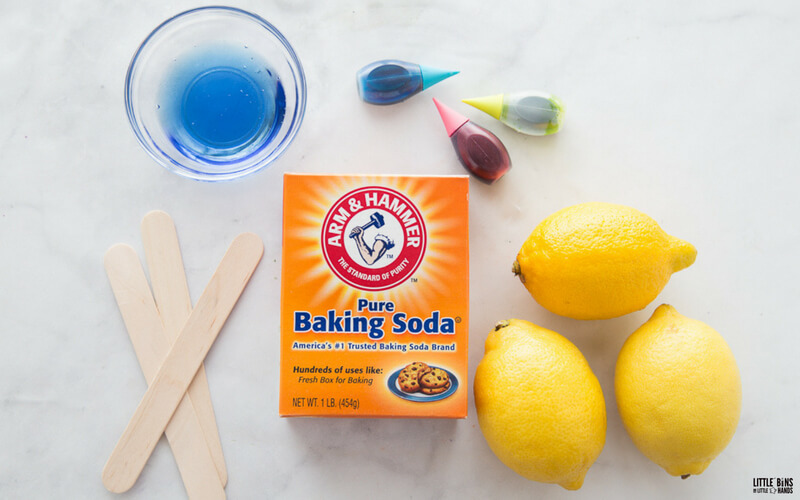 Now you can go ahead and sprinkle a generous amount of baking soda onto the top of the lemon. Then you can go ahead and use a craft stick to press some of the baking soda down into the different sections of the lemon to get the eruption gong. How is our lemon volcano erupting? The chemical reaction of course. The critic acid from the lemon juice is reacting to the base of the baking soda created a gas called carbon dioxide. Bubbling, fizzing carbon dioxide which creates a rainbow of colors. This fizz also helps the dish soap create a more exaggerated eruption. Wait a few minutes for the reaction to begin taking place. Slowly, your lemon will begin to erupt into a variety of colors. 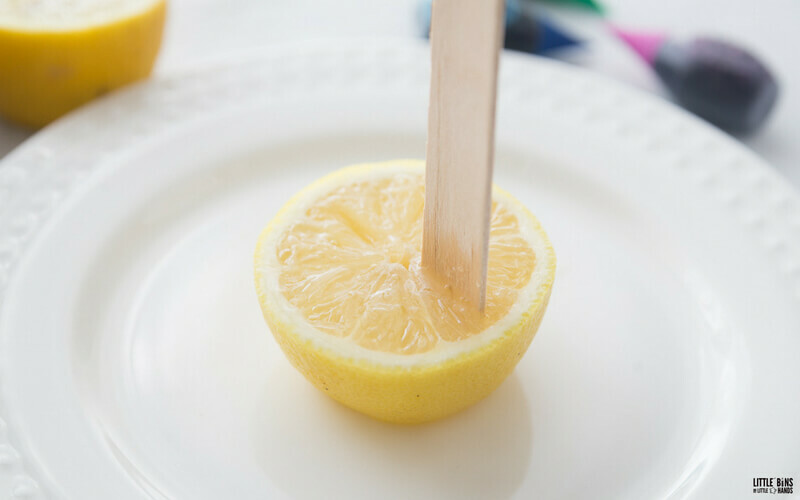 Additionally you can use the craft stick to mash the lemon and baking soda around a bit more! You can add some additional baking soda when the first round of erupting has taken place to continue the reaction. This experiment produces a very slow eruption of color. 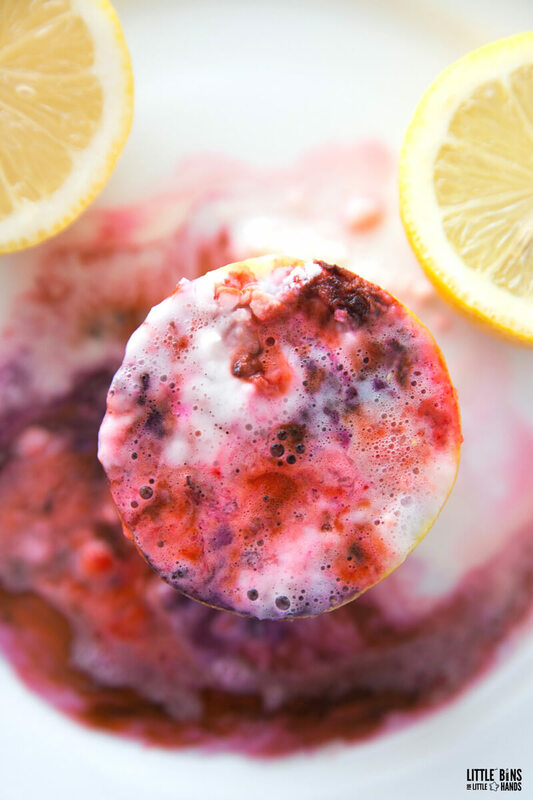 If you would like things to move a bit faster or to be more dramatic, you can pour a little extra lemon juice on top of the lemon as well. Your erupting lemon volcano will be a big hit, and I am pretty sure your kids are going to want to keep testing it out! That’s what makes it much great playful science. You did it! 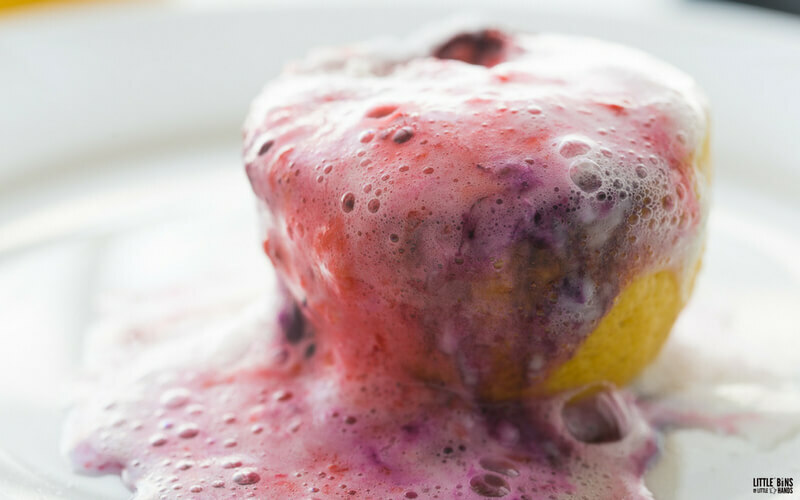 Kitchen science made easy with an irresistible erupting lemon volcano science experiment for cool chemistry! Want to check out some more cool chemistry with videos? Click on the links below. So many awesome science experiments, activities, and demonstrations start with simple supplies you may already have on hand! 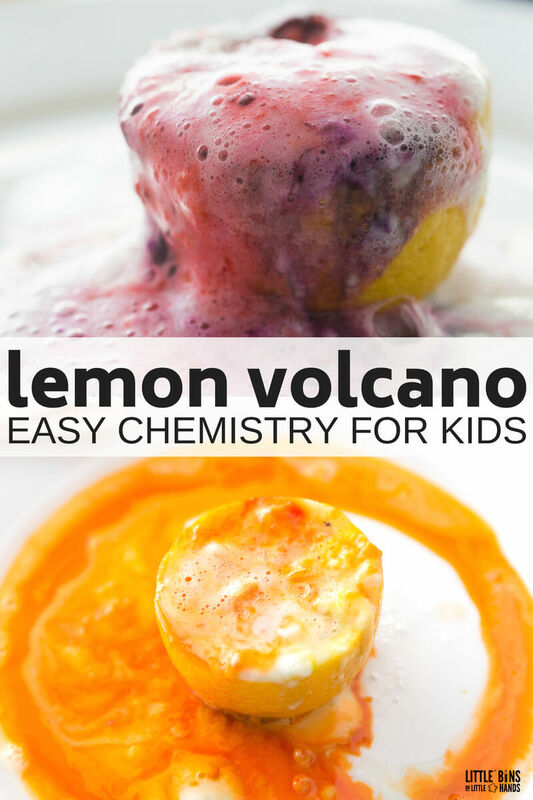 CRAZY CHEMISTRY WITH A LEMON VOLCANO!